28 Jan 2019 – Why illegitimate? Have those who claim that Nicolas Maduro is a dictator, a usurper and that the 2019-2025 presidential period lacks legitimacy asked themselves this question? Or do they just repeat what they hear? The leaders of the Venezuelan opposition, we refer to the non-democratic one, tirelessly repeat, and of course without arguments, that Maduro is a usurper. In an act of desperation, the Vice President of the United States himself, Mike Pence, when forced to personally call out the opposition march for January 23, due to the incompetence of the opposition leadership, insisted and repeated that President Nicolas Maduro is a usurper and illegitimate dictator. The strategy is clear: to repeat the lie a thousand times in order to turn it into truth. There were presidential elections. They were held on May 20, 2018, that is, before January 10, 2019, when, according to articles 230 and 231 of the Constitution, the presidential term 2013-2019 expires. It would have been a violation of the Constitution if the elections had been held after January 10, 2019, or worse still if they had not been held. It was the Venezuelan opposition that asked for the elections to be brought forward. They were held in May and not in December, as was traditionally the case, because it was the opposition that requested it, within the framework of the dialogue in the Dominican Republic, that took place in the first trimester of 2018. In Venezuela, voting is a right, not a duty. Those who freely decided, although influenced by some non-democratic political organizations that called for abstention, not to go to the polls, are in their full right, but in no way does this make the electoral process illegitimate, even less so when that would imply ignoring and disrespecting the 9,389,056 who decided to vote and democratically exercised their right to suffrage. Sixteen political parties participated in the electoral contest: PSUV, MSV, Tupamaro, UPV, Podemos, PPT, ORA, MPAC, MEP, PCV, AP, MAS, Copei, Esperanza por el Cambio, UPP89. In Venezuela, it is not mandatory for all political parties to participate in electoral processes. They have the full right to decide whether or not to participate. Precisely because our system is democratic. The fact that three parties (AD, VP and PJ) freely decided not to participate does not make the electoral process illegitimate. 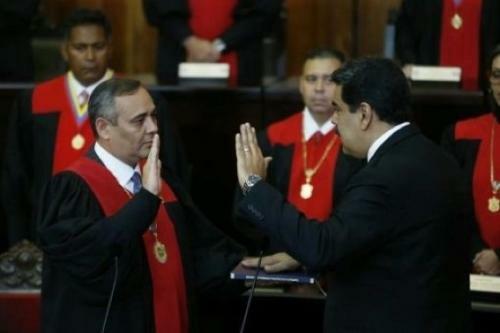 Six candidates contended for the presidency: Nicolás Maduro, Henri Falcón, Javier Bertucci, Reinaldo Quijada, Francisco Visconti Osorio and Luis Alejandro Ratti (the last two decided to withdraw). Maduro won by a wide margin, obtaining 6,248,864 votes, 67.84%; followed by Henri Falcón with 1,927,958, 20.93%; Javier Bertucci with 1,015,895, 10.82% and Reinaldo Quijada who obtained 36,246 votes, 0.39% of the total. The difference between Maduro and Falcón was 46.91 percentage points. Around 150 people accompanied the electoral process, including 14 electoral commissions from 8 countries; 2 technical electoral missions; 18 journalists from different parts of the world; 1 MEP and 1 technical-electoral delegation from the Russian Electoral Centre. The elections were held using the same electoral system used in the December 2015 parliamentary elections, in which the Venezuelan opposition won. This system is automated and audited before, during and after the elections. This system guarantees the principles of “one elector, one vote” because only with a fingerprint is the voting machine unlocked; it also guarantees the “secrecy of the vote”. Eighteen audits of the automated system were carried out. The representatives of the candidate Henri Falcón participated in all [the] 18 [audits] and signed the acts in which they [expressed] their conformity with the electoral system. The audits are public and televised live on the channel of the National Electoral Council. Once the audits have been carried out, the system is blocked and the only way to access it again is with the simultaneous introduction of the secret codes that each political organization holds. None of the candidates who participated in the electoral process contested the results. There is no evidence of fraud, they did not present any evidence or concrete denunciation of fraud. The presidential elections of May 20, 2018 were free, transparent, reliable, secure and in accordance with the Constitution and the laws despite the anti-democratic call for abstention on the part of one sector of the opposition. It is others who seek to usurp the office of President of the Republic with the argument of a supposed power vacuum, a figure that is not contemplated in our Constitution and the establishment of a “transitional government”, a figure also not contemplated in the Magna Carta. And as if that were not enough, they intend to exercise power outside our borders in violation of Article 18 of the Constitution, which establishes that Caracas is the seat of public power. Things being as they are, the usurpers, those who are illegitimate and anti-democratic, are others. It is illegitimate and constitutes an attempted usurpation that some sectors of the opposition are trying to sustain themselves with the support of foreign actors coming from imperialist governments to exercise an authority that neither the people nor the Constitution gives them. Let us repeat these truths a thousand times.